Sigh. The last peanut-milk-meal + chocolate post of the 2012 MoFo season! This recipe is based on Cookie Bites by Erika over at Good Clean Food. With my first taste of those nutty-chocolatey bites, I knew I’d be making them at home – and making them again with a few minor twists. Enter peanut milk and peanut meal. By the way, is it sacrilege to say that I’m relieved that the light at the end of the MoFo tunnel is visible?? 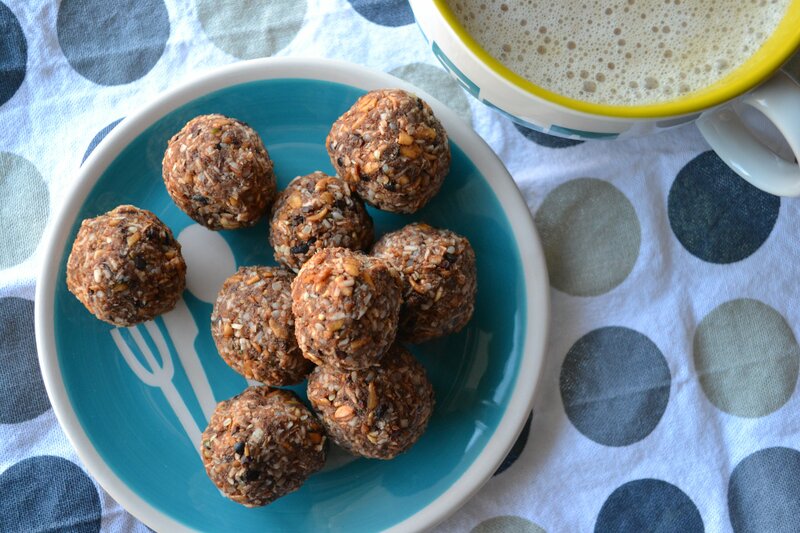 For another yummy recipe, check out Blissful Britt’s No Bake Energy Bites – or – Raw Almond Coconut Energy Balls from The Veg Bar. Stir in the hemp seeds, coconut and flaxseed meal and mix until all the ingredients are moistened and thoroughly combined. Add more peanut milk if the mixture seems dry. Store in an airtight container for a few hours or overnight. Form the mixture into walnut-sized balls. Keep in the refrigerator. In a food processor, process the mixed grain (or oats) until broken down into small pieces. Remove from the processor and place in a large mixing bowl. Put the peanuts, peanut milk and peanut meal in the food processor and process into a nice, thick slurry. Add the cocoa powder, chia seeds, maple syrup, cinnamon, salt and vanilla and process to combine. Remove from the processor bowl and add to the grain mixture. I used just plain old roasted, unsalted nuts – you can buy them in bulk or in a jar/bottle (shells already removed). I know some folks make milk w/ raw peanuts, but I haven’t been able to find them either. Ohhh, okay – thanks, that helps alot! I’ll need to do better sleuthing at Whole Foods – and come to think of it – I didn’t check the “health food” store nearby. Hmmm… peanut milk/meal redux! Chocolate and peanut butter, you speak my language. I decided the same thing, Holly – leave the MoFo for the other vegan bloggers ;-)! Um, I think I know what you’re bringing to the movie…. Haha! Finally! Something I can contribute! Ohhh I love balls!! Bahah these look SOOOO good!! Thanks for the link up too!! YAY for energy bites and cocoa balls! Apparently quite a few of us love balls ;-)! I have to say I’ve never heard of peanut milk! Is peanut meal, like peanut flour? I see how you made it in the other post, but is it what you’d compare to PB2? and stuff, or is it different? It does come out quite a bit like PB2, actually, though I haven’t tried to “reconstitute” my meal the way one does PB2. Interesting experiment, though! Yeah, I second the comment on what is peanut meal and peanut milk? I’ve actually never heard of those 2 things. Lovin’ the peanut butter and chocolate combo!!!! Hehe – alas, it’s true. I say that with much relief, actually! It never is, CCU! I start with two ;-)! I just stumbled upon your page. Glad I did. These look good! Glad you found me – how cool! They are very good and very addictive. Nice to meet you :-). It makes me sad to hear that you are looking forward to the end of MoFo–I look forward to your posts and will miss them next month! I know it must be a ton of work, so thank you for it! I really do enjoy reading each and every one! Aww, you’re a sweetheart! I’ll be posting in November, just not quite so often :-)! And of course, Nov. 1 is the Potluck – 106 of us posting amazing vegan recipes! Yummo! I’m not sure if “plenty” will be enough for me though…. my appetite when it comes to peanuts/chocolate is horrendously LARGE! Best to take the whole batch along ;-)! I love the ‘peanut milk’ ingredient. Isn’t it so fantastic not to be limited to milk, eggs, flour and sugar like so many of us grew up on? Vegan recipes are so much more creative and yummy!!!! These look like little bites of love for your body. Thanks for sharing them! That’s the thing, isn’t it?? How amazing vegan baking/cooking is? I eat far more interestingly than I did as a carnivore. So much goodness packed into these little balls Annie! I haven’t made any “balls” in ages- now I need to! Man cannot live on cheeze alone (although lord knows I am trying!) and these delicious little energy packed morsels wouldn’t last too long in the fridge I would imagine. You will need a month to recover from vegan mofo but think of all of we humble bloggers and readers who fed our minds and bellies from this fantastic month of gorgeousness…you fed more than a nation girl! You and your fellow bloggers fed the world amazing vegan tucker! I think that if I was given a choice (although as an Aussie…I severely doubt that I would! 😉 ) to vote in the coming elections, my vote would be a joint vegan vote for you and Somer for president. I reacon that who cares if you don’t have an economic platform…it hasn’t helped the economy so far! Lets just get everyone on the same platform eating this amazing food, spending their days considering their rapidly expanding navels and enjoying the wealth of health that would slowly seep into their conciousness…can’t be worse than the state of affairs at the moment? 🙂 “Annie and Somer for president!” Do I hear an Amen?! We do make a pretty awesome team ;-). I am always looking for good ways to use my leftover almond meal- these look like perfect pre-workout snacks!